Over the last two years, The Crawford Fund have been partnered with Dr Leigh Vial on his project to improve the livelihoods and food security of Laos farmers through the introduction of dry-seeding technology. 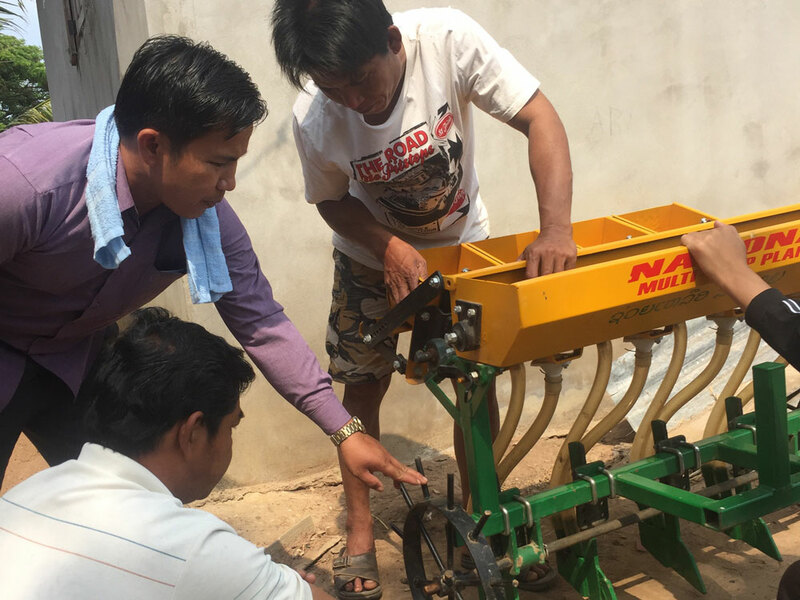 Farmers inspect a new seeder in Laos. Photo: Leigh Vial. Dry-seeders are semi-automatic machinery that assist with seeding and fertilising crops in dry soil conditions. Dr Vial’s seeder program is reducing labour, effectively fertilising crops, enabling farmers to plant crops earlier in the season and allows farmers to incorporate new crops into their farm land with workshops conducted in maize seeding. Dr Vial has kept in touch with The Crawford Fund about his progress, you can read his reports below. Early in 2017, 10 seeders were delivered to 10 Laos farming communities. During Dr Vial’s visit to each community, he conducted demonstrations and training workshops with famers. The seeders were met with an overwhelmingly positive response fuelled by the prediction that the technology would improve working conditions and livelihoods of the participants, Dr Vial reports. Later in 2017, Dr Vial reported on the challenges facing farmers. The early arrival of the wet season prevented participants from using their dry-seeding technology to full capacity. Dr Vial reports on other challenges and how they were solved in preparation for the following wet season. In 2018, Dr Vial revisited the dry-seeder program where he met with program participants to review progress and uptake of the seeders. Dr Vial addressed common issues, barriers for uptake of the technology, upskilled participants and introduced new technology to improve outcomes. Dr Vial’s latest report can be found here.